As a car owner, you need to know the ins and outs of your vehicle and what better way to start than to learn all about automotive headlight bulb sizes. The following guide will help you get a better understanding of the different aspects related to car headlights, and also how you can replace one on your own. Why Are They Different Sizes Of Bulbs? When you start looking for a headlight bulb for your car, the first thing you will notice is that these bulbs come in various sizes. Each of these headlight bulb sizes is represented with number and letter configurations (which you will find in the link given above). For instance, if you opt for an H4 headlight bulb for your car, you are actually opting for a 9005 size headlight bulb. It is not essential for you to understand the meaning of these letters or number, but you need to know that you purchase the right-sized headlight bulb. Perfect Fitting- It is obvious that all vehicles are designed differently, meaning that the headlight socket for every vehicle is different. However, headlight socket designs fall in specific categories, which implies that the headlight socket of your car will accept a particularly sized bulb. Knowing the correct size and number will help you narrow down your search for a new headlight bulb. Dimension Difference- Bulbs come in various dimensions which implies that the headlight space design will dictate what kind of bulb you can opt for. Choose the one that is sized properly to fit into the headlight space; else you will just be wasting your money. Some of the most popular headlight bulb sizes used in modern day vehicles include the following: H1, 207, H6W, 233, H3, 239, 245, H3C, H4, H15, H13, 380, HB3, 382, H1R2, H7, HB4, H8, H9, H11, HB4A. All the major brands offer headlight bulbs in these sizes, which you can use either for replacing your old headlight bulb or upgrading your current bulbs. Step no.1- First off, power down the vehicle and take out the keys from the ignition. This will ensure safety for both you and the vehicle. Step no. 2- Pop open the hood of the car and look for the location of the headlight holder, close to the front end of the vehicle. Step no.3- Generally, 3 wires are attached to the light bulb base. You need to push down the cap or clip that holds them. Step no. 4- Next; loosen up the existing headlight bulb. Be careful, as not all cars offer you the ability to easily reach the headlight bulb. There are some vehicles in which you have to take out the inner fender to get past the air filter housing or the battery to get to the bulb. In case you break those clips holding the lightbulb, you will need to take the entire headlight out, so exercise maximum caution at the time of replacing the headlight bulb. Step no. 5- Screw the new bulb into place carefully. Be gentle and don’t touch the bulb glass as dirty and oily hands will cause the lightbulb to burst as soon as it gets heated up. Now, you can fix the car back into place, and you are ready with new headlight bulbs for your next ride to town. What Kinds of Options Does Someone Have When Picking Bulbs? The Halogen Bulb- This type has been around for the longest time period and dates back to the 1960s. The halogen bulbs emit more light than the traditional ones by consuming the same power. Their effectiveness stands witness to their existence to date. This is because these bulbs are made up of halogen chemical (reactive) in gas form, and contain tungsten filament (single), which is encapsulated with this halogen chemical. Halogen bulbs emit bright light (white). The HID/Xenon Bulb- World-famous company, Philips, launched the HID or High-Intensity Discharge bulbs as an improvement to the halogen bulbs. These bulbs don’t work on burning filament, but instead use a light arc placed between the two electrodes situated inside a chamber filled with xenon gas. This arc is made up of ionized xenon, which produces a current between the electrodes, thereby emitting a blueish bright light. The luminous efficacy of these lights is better than the halogen bulbs, which increase the visible spectrum. 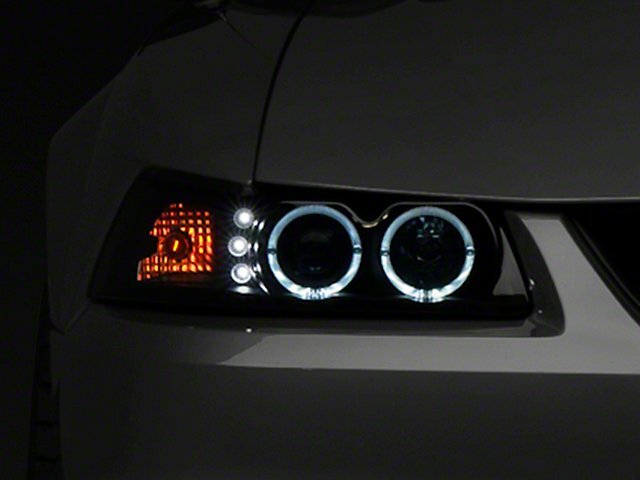 This means that you can see better with the Xenon bulbs as their brightness is more than the halogen ones. And since there are no filaments, these bulbs last longer than the halogen bulbs. However, they require more power than halogen or LED bulbs, and the glare produced by these bulbs is too powerful. That is why you may require fitting in beam leveling control (automatic) and lens cleaning system to avoid any untoward incident while using these bulbs on road. The LED bulb- The LED or Light Emitting Diodes bulbs do not wear and tear like the Xenon or halogen bulbs. The durability of the LED bulbs can last a lifetime, and certain manufacturers claim durability of up to 30,000 hours. They require very little power as against the two other headlight bulb types. And the light intensity emitted by LED bulbs is way higher than HID or halogen bulb. The light is crisp and white, somewhat like daylight, thereby offering maximum illumination with fewer glares. NOTE: DMV.org has an excellent article that will let you learn more information about appropriately replacing bulbs on any automobile. In Conclusion & Is There A Source for Comparing Headlights? Hopefully, now you have a clear picture about headlight bulb sizes and varieties, along with steps to install a headlight. However, picking the right size is the key to successfully install a new headlight bulb to upgrade your vehicle. We have a guide on picking an excellent set of led bulbs which by default, far outweigh old halogen bulbs. You can click here topratedanything.com/best-led-headlight-kits-to-buy to read up on it and see exactly why LED’s are superior.